If resources in your business were tight, and you had to choose between reporting and engaging, which would it be? Here is why I would choose engaging. Reporting is a quality assurance process with its roots in twentieth century industrial processes. I regard the current day sustainability movement to have started in the early sixties, when Rachel Carson and others raised concern about the negative impacts of commercial activity. Initially the companies that found themselves the target of criticism ignored it, but over time they, initially reluctantly, realised they had to take action. Shell is an excellent example of this. In the mid-nineties, Greenpeace and others protested about the disposal of the Brent Spar and Shell’s alleged complicity with the Nigerian Government’s execution of activists. Initially the company attempted to repel criticism, but over time internal discourse changed to include sustainability. Shell was an early adopter of the Global Reporting Initiative (GRI) and soon regularly ranked in the top ten of global reporters. BP also performed consistently highly in GRI reporting and appeared genuinely committed to its rebranding “Beyond Petroleum”. But recent events in the Gulf of Mexico illustrate how reporting processes do not necessarily ensure a good outcome. In this case, better engagement with suppliers appears to be desirable. Reporting is essentially a compliance process. The great thing about compliance processes is that they provide assurance that the plane we are about to fly on is well maintained, or a product we buy is fit for purpose. The downside is, that if they become the default organisational strategy, they can generate a compliant and uninspired workforce. The compliant workforce knows what it can and can’t do and tends to operate within these parameters. These days, for most commercial activity, compliance is unavoidable. One or more industry bodies or standards organisations and multiple local, state, national or federal government departments require our compliance. And we are often complied to report. Why impose further voluntary compliances on your workforce? Might it not be useful to foster other methods? This is where stakeholder engagement processes are useful. While reporting is a twentieth century practice, stakeholder engagement is of this century. Complying (through reporting) and engaging are diametrically opposed. The former follows prescribed practice while the latter seeks opportunity. Engagement is essentially a communication process and our twentieth century organisations didn’t do that very well. Now we understand communication processes better, and our workplaces feature more diversity (in age, gender, culture and ethnicity) of necessity, we have to learn to engage better. Engagement can thus pursue sustainability aspirations, but also improve communication internally and externally – the stakeholder engagement win-win. Zappos is a great example of excellent engagement. In CEO, Tony Hsieh’s great read Delivering Happiness, he outlines “happiness frameworks”. 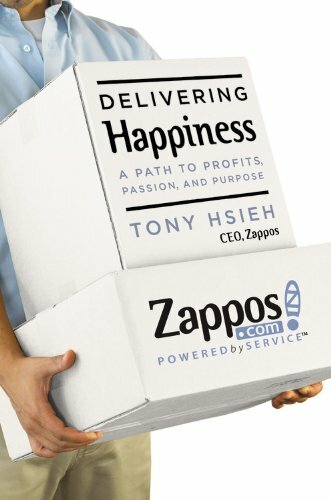 Tony highlights happiness as one of the foundations for Zappos stellar success. His first happiness framework includes four factors, perceived control, perceived progress, connectedness and vision/meaning. These factors foster happiness and create a motivational culture. Lets look at how these might stack up with reporting and engagement. Of course this is a very stark contrast, and in reality the gap will not be so great, and some companies (such as Canada’s Vancity) do a great job of both reporting and engaging. It takes some courage to prioritise engagement over reporting. A business’s capacity to engage is enhanced by effective internal engagement – where every staff member is an ambassador for the business. So it takes courage and commitment to first accurately assess the quality of internal engagement, and then to relentlessly pursue better engagement. But the payoff, socially, environmentally and financially is huge. Failure to engage will accelerate mass business extinctions. This entry was posted in Stakeholder engagement, Sustainability and tagged corporate sustainability, Peter Bruce, Stakeholder engagement, Sustainability 2.0, sustainability reporting by Peter Bruce-iri. Bookmark the permalink. Peter, very good observations. This has implications for the entire organisation. I’m thinking of our programme advisory committees where we engage with industry. We are trying to move those more toward engagement rather than reporting. I’ll forward this to our Heads of Departments for the West Coast. I think our GM will find this of interest as this issue is of direct relevance to our work.